In medium bowl, stir together melted butter, mustard, vinegar, thyme, salt, and cayenne pepper. 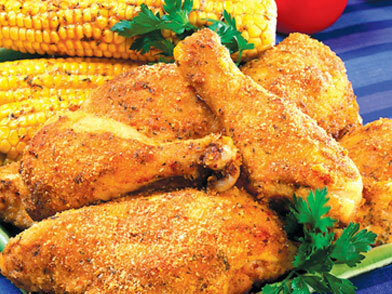 Brush corn and chicken thoroughly with butter mixture. 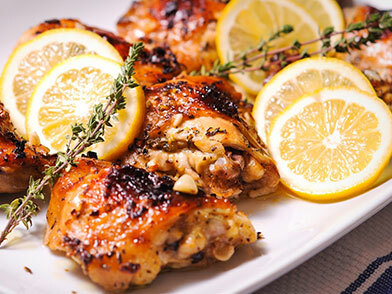 Arrange chicken in one layer in a baking dish. Sprinkle chicken with breadcrumbs. Set corn in another baking dish; cover with aluminum foil. Bake chicken and corn for one hour; serve hot. In large Dutch oven or ovenproof, lidded skillet, warm olive oil over medium high heat. Season pieces of chicken with salt and pepper. Place chicken in pan in single layer (in batches, if necessary), and cook chicken, turning, until well browned, about 10 minutes per side. Remove chicken from pan and set aside. To pan on stove, add onion, carrot and celery; saute until slightly softened, about 2 -3 minutes. Add garlic, rosemary and oregano; sauté one minute more. Add tomatoes and peppers; cook 3 - 4 minutes. Add wine, increase heat to high and boil until liquid reduces by half, about 8 minutes. Add vinegar. Return chicken pieces to pan, cover, and place in oven. Cook chicken until tender and cooked through, about 45 minutes. Melt margarine in large nonstick skillet. Add chicken; cook over medium-high heat 5 to 7 minutes or until light brown. Add water, rice, bouillon cubes and juice from one lemon half. Bring to a boil. Cover, reduce heat, and simmer 20 minutes. Add broccoli, carrots, and cauliflower; continue cooking 5 minutes or until internal juices of chicken run clear. Cut remaining lemon half into slices and use for garnish. In medium saucepan, bring water mixed with 1/2 teaspoon salt to boil. As soon as the water comes to a boil, add asparagus and boil until tender, about 3 minutes. Drain. Set aside until needed. 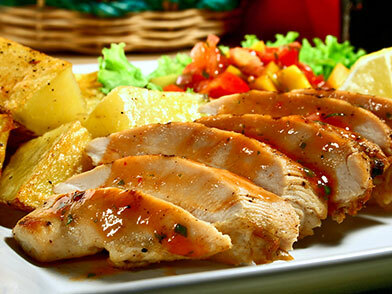 Lay chicken breasts between sheets of plastic wrap and pound to 1/2 inch thickness. On a medium plate mix flour with 1/4 teaspoon salt and pepper; dredge chicken to coat, patting off any excess. In medium, non-stick fry pan over medium heat, warm 1 teaspoon butter, and oil. saute chicken breasts on both sides until browned and firm, about 3 minutes per side. Remove chicken; keep warm until ready to serve. Add onion to skillet and saute until softened, about 4 minutes. Increase heat to high; add tomato and saute until most of the moisture has evaporated. Lower heat to low and add crab meat; toss gently, just until hot. 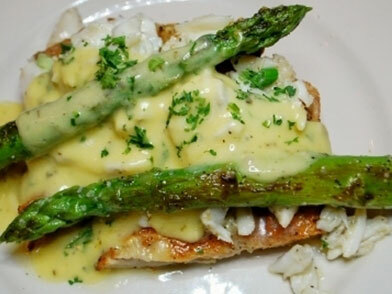 To serve, set one chicken breast on each plate; arrange 5 asparagus spears on top of each. Spoon some of crab mixture over asparagus and drizzle with Lemon Chive Sauce. Garnish with cherry tomatoes. In small saucepan over low heat, melt 1 tablespoon butter with lemon juice to make sauce. Whisk in cream cheese, milk, and chives until smooth. Prepare rice noodles according to package directions; drain and set aside. Working with one sheet of rice paper at a time, completely immerse a sheet of rice paper in hot water for a few seconds. Remove from water; lay flat on work surface. 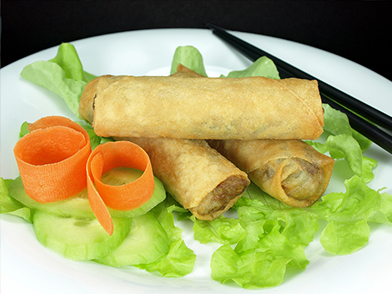 On one half of rice paper, place small handful of lettuce and carrots, four slices of chicken, two or three cilantro leaves, two or three mint leaves, a pinch of scallion, four or five sliced mushrooms and a small wad of noodles. 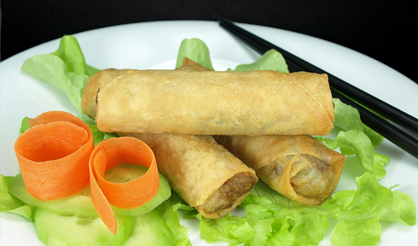 Fold bottom half of the rice paper up over the filling; roll up the sides of the paper to close roll into a pocket. Serve on 8 small plates over additional lettuce leaves, with Spicy Tomato Chili Sauce and Peanut-Hoisin Sauce (recipes follow). In medium bowl, whisk together flour, cornmeal, salt, celery salt, pepper, paprika, and cayenne. Dredge chicken pieces in flour, two at a time, turning to coat all sides thoroughly. Set chicken on a rack and let sit for 30 minutes. In medium saucepan over medium heat, warm butter. Stir in onion, red pepper, and green pepper. Stew peppers until soft, about 10 minutes, stirring occasionally. Stir in flour and cayenne. Cook for 2 minutes, stirring often. Gradually stir in chicken broth. Bring sauce to simmer; reduce heat to low and let cook until thickened, about 5 minutes. Add salt; remove from heat and set aside until needed. 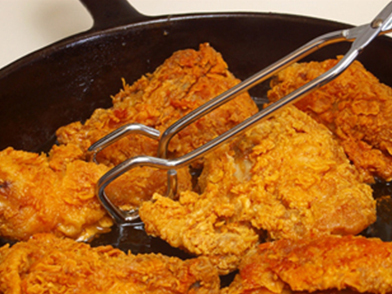 In large, cast iron skillet add oil to fill 3/4-inch deep. Over medium-high heat, warm oil to 350°F. Use kitchen thermometer to test oil temperature. Carefully place chicken, skin-side-down in oil. Reduce heat to medium and cook chicken for 15 minutes until nicely browned. Turn chicken and cook for additional 10 minutes, until internal temperature on thermometer registers 180°F. Remove chicken and drain on paper towels. Cook remaining chicken in same manner until done. Before serving, reheat sauce and pass separately.